Hey, y'all! Today I have some VERY easy art to share with you. It's easy enough for those of you who think you don't have an artistic bone in your body. Seriously. But its art so fab that it looks like you're the type to wear a beret and stare at a painting for thirty minutes absorbing the essence of the artist who created it. Okay, maybe I'm going overboard here, but it's really simple to make and looks very artsy. 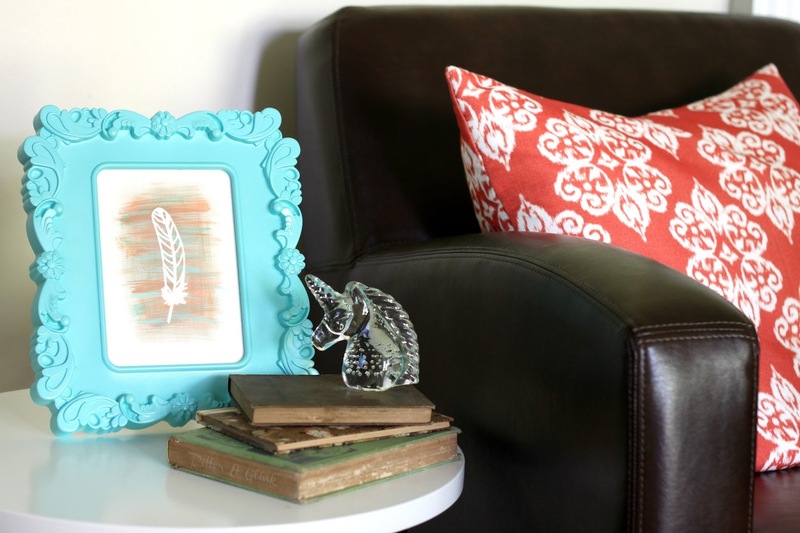 (It's my feather art, not to be confused with my other feather art.) 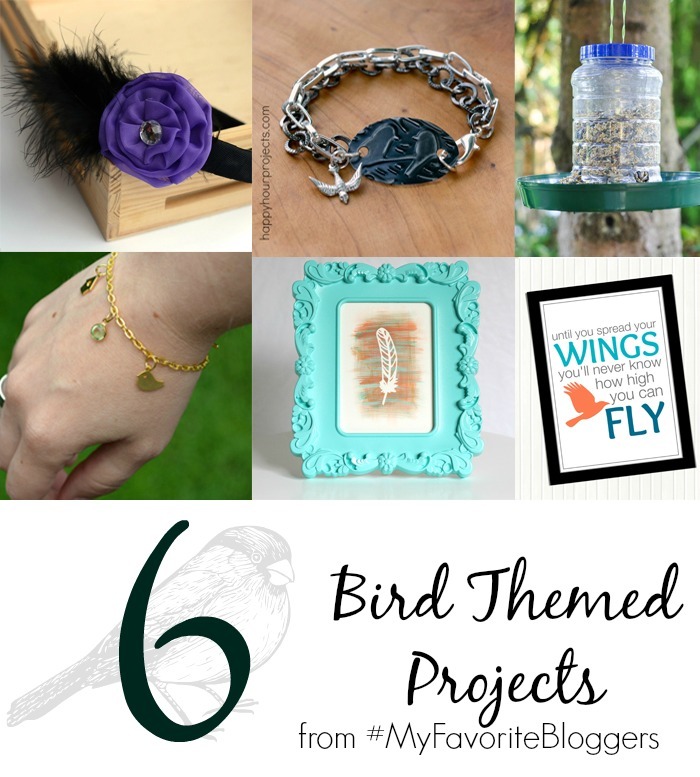 And be sure to hang around until the end of the post because I'll be sharing links to five other bird themed projects AND a $70 Target e-gift card giveaway as part of this month's My Favorite Bloggers. This art started with a piece of acrylic paper. 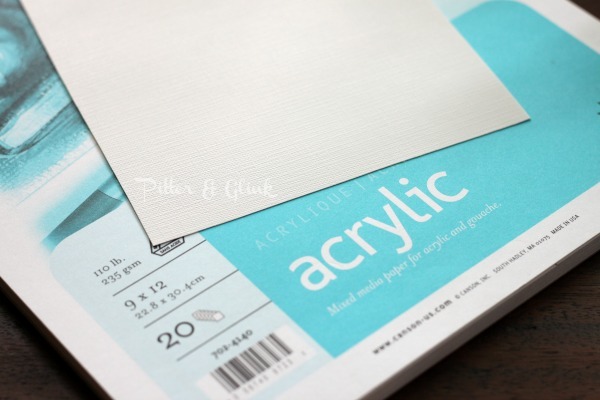 You can find acrylic paper in the art section of Walmart or craft stores. Acrylic paper is thick like water color paper, but it's not absorbent. It's the texture of a canvas but has a finish somewhat like semigloss paint. 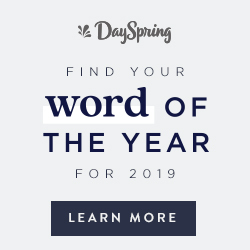 (Sometimes it amazes me that my job deals with teaching others to use words when I have the weirdest ways of using them myself.) I cut a piece of the paper to fit a 5x7 frame. I also cut a feather from vinyl using my Silhouette. 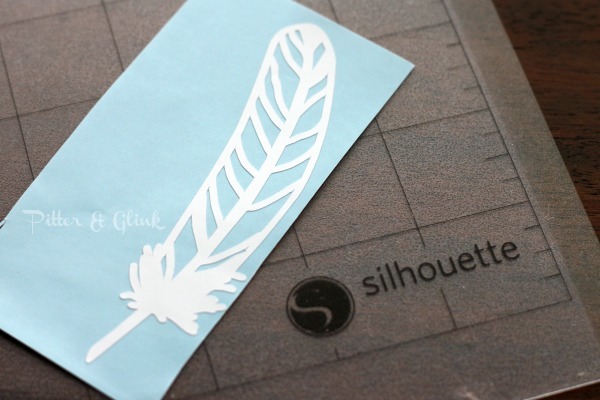 This feather can be found in the Silhouette store, but I offset it so that it wouldn't be as "delicate." 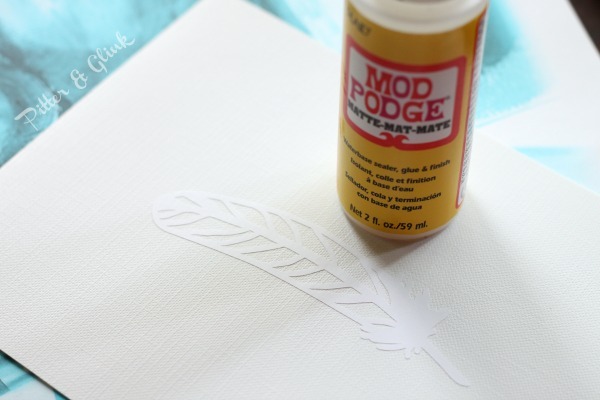 I used transfer paper to transfer the feather to the middle of the paper. Then I sealed the feather with a thin layer of Mod Podge to ensure that no paint would seep under the vinyl once I started painting, which was the next step of the process. Painting was soooo easy. I loaded a flat brush with a small amount of coral paint and lightly brushed it over the feather horizontally and vertically. I repeated this process with turquoise and then gold paint. There's really no right or wrong way to do this, and you're finished layering paint when you decide you are. :) Once I was happy with the way the paint looked, I carefully peeled off the vinyl feather. 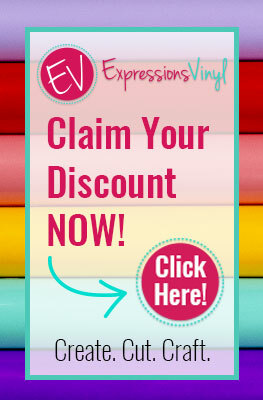 (This is when using the acrylic paper comes in really handy because you don't have to worry about the paper peeling off with the vinyl.) 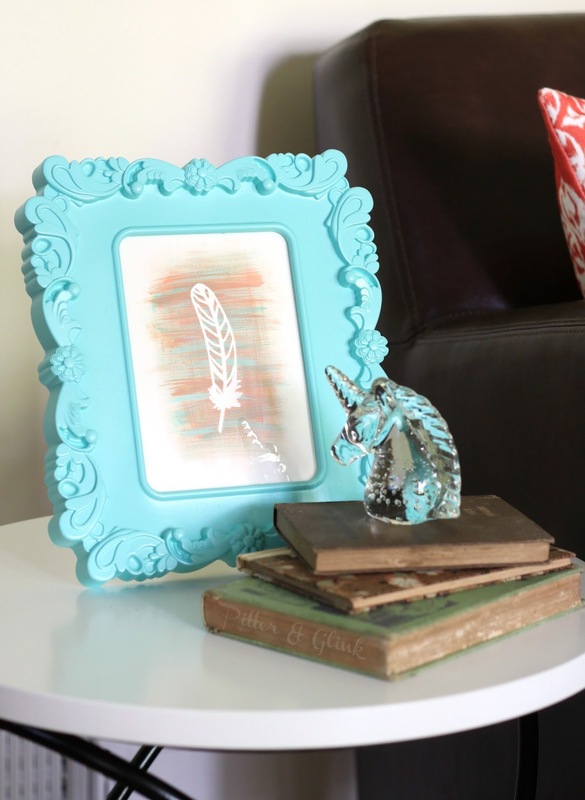 I placed the feather in an Ikea frame spray painted aqua, and voila, my art was complete! 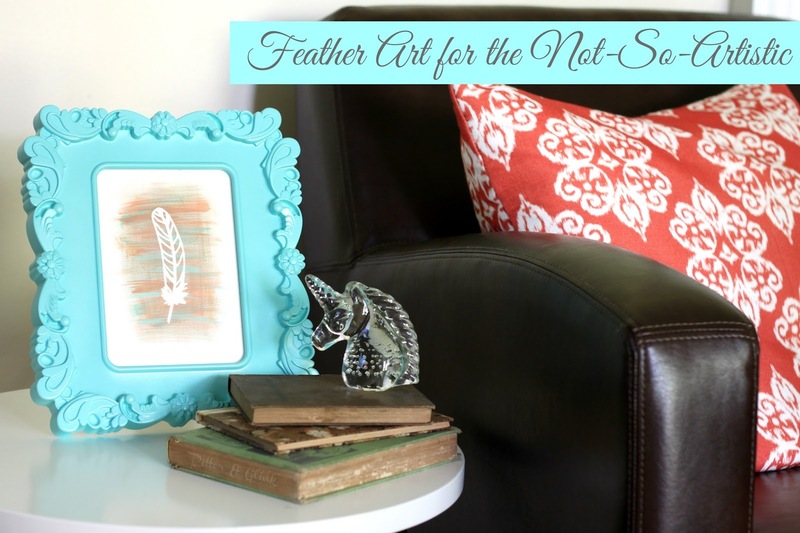 I'm definitely not an art connoisseur, but I think this little piece of feather art looks pretty good for the little bit of effort that it took to create. I mean, you could seriously do this even if you can't draw a stick figure! The art pulls together some of the colors that I'm using in my living room makeover that is probably in the running for the longest makeover in the history of makeovers. Never fear, though. I am determined to finish the makeover before the summer is over. And now it's time for me to share five other bird themed projects from My Favorite Bloggers! Make sure to visit my blog buddies to check out their awesome projects! And as promised, it's time for a GIVEAWAY!!!! Do you love Target? I know I do! 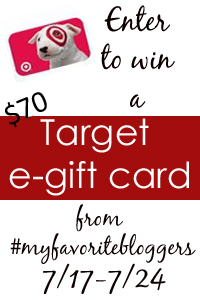 One lucky reader is going to win a $70 Target e-gift card!!! (I'm so jealous!) The giveaway is open until July 24, 2014 for residents of the US and Canada, so get your entries in while you can. This is very pretty, great technique. I'll have to look for that paper, I can think of a number of ways to use it. I love it, Bethany! It's simple, but beautiful too! Okay, that is BRILLIANT! It is lovely, as well!